Note from Daily Trade Alert: A couple weeks ago we launched a new regular column here at Daily Trade Alert called High-Yield Trade of the Week. The goal of this column is to show our readers how to safely boost their income from some of the best stocks in the world. It’s our sincere hope that you benefit from this new service. This weekend I’m hanging out with one of my good friends, who is also my former boss and investing mentor. He’s visiting from Austin with his family. I’m looking forward to some pickleball, boating, grilling, and s’mores (for the kids, of course). I’m also anxious to talk shop. He’s a brilliant investor and entrepreneur. He’s found success in both residential and commercial real estate… he’s opened a boutique hotel… he’s co-founded an all-natural cleaning products company (that’s wildly popular on Amazon)… and rumor has it, he’s about to launch some kind of candy company. My friend also happens to be the one who sold me on the idea of dividend investing about a decade ago. Well, he didn’t really sell me… he didn’t have to. One look at his personal portfolio and I was convinced. At the time, I was working on an investment research project for him at one of the financial publishing companies he had co-founded. This particular project gave me a first-hand look at the income his stock portfolio was generating. What I saw was incredible: Almost daily, a fresh dividend check was coming into his account… to the tune of $4,000 to $5,000 per month. I noticed that over the previous 12-month period he had collected over $50,000 in dividends alone. That was entirely passive income that flowed into his brokerage account. What I mean by “passive” is that he didn’t have to do anything special to collect that income. He didn’t have to wake up and go to work for it. He didn’t have to call anyone or submit any kind of paperwork or anything like that. All he did was buy shares of high-quality, dividend-paying companies when they were trading at good prices and then hold them. Then, like clockwork, every month or quarter, these companies would send him a dividend check. Because he owned stock in dozens of companies, he was collecting dozens of dividend checks each and every month. And because many of the companies he owned had a tendency of increasing their dividend each year, his passive income stream was poised to grow larger and larger over time. I haven’t seen my friend’s stock portfolio since that research project. But even if he never reinvested any of his dividends over the past 10 years, thanks to organic dividend growth, I wouldn’t be surprised if he’s pulling in over $100,000 per year right now in passive income. That first-hand look at my friend’s portfolio is what got me hooked on dividend growth investing. It’s the main strategy I use in my brokerage accounts, and the only one I know of that’s designed to pay a passive, predictable income stream that goes up over time. There’s only one catch with this strategy: It does indeed require time. The dividends you collect and then reinvest need time to allow for both dividend growth and the magic of compounding. But what if you don’t have time? What if you’re nearing or already in retirement and you need high income right now? If this is the situation you’re in, and you need high income today, then I encourage you to consider our High-Yield Trade of the Week strategy. In short, the strategy I’m talking about involves selling a cash-secured put or a covered call on a high-quality dividend growth stock when it appears to be trading at a reasonable price (at or below fair value). And because you’re collecting immediate income, you’re lowering your cost basis on the shares you’re buying, which means this strategy is actually safer than purchasing shares of the underlying stock outright. With all of this in mind, let’s get to this week’s High-Yield Trade of the Week— a trade with one of the highest-quality companies in the world, and one that could pay you 14.4% to 32.7% in annualized income. As an investment, Cisco meets all my criteria: It’s a high-quality dividend growth stock that appears to be trading below fair value. Because of Cisco’s fast-growing dividend and reasonable valuation, I think long-term investors could do well buying at today’s market price, holding for the long-term, and reinvesting dividends along the way. 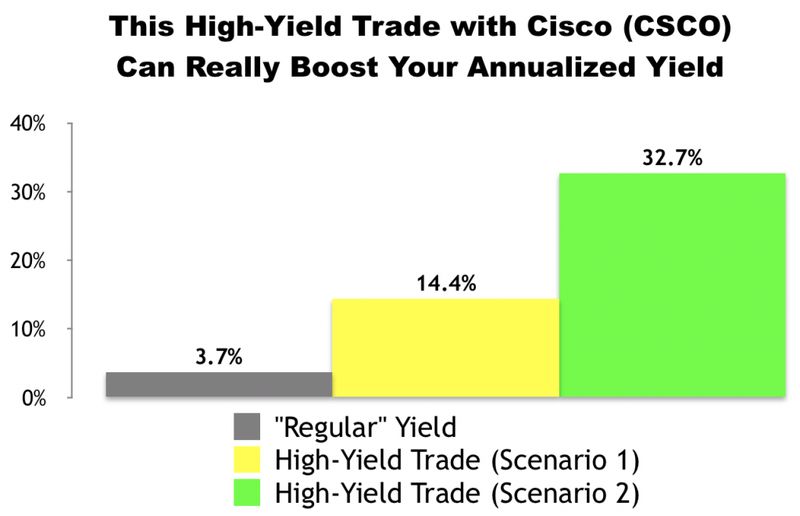 For those looking for high current income, Cisco does well with its 3.7% dividend yield. But you can do even better with our High-Yield Trade of the Week. You see, by selling a covered call on these very same shares, we can boost our income significantly — generating an annualized yield of 14.4% to 32.7%. That’s over triple the stock’s “normal” income! As we go to press, CSCO is selling for $31.34 per share and the August 25 $32.00 calls are going for about $0.52 per share. Our trade would involve buying 100 shares of CSCO and simultaneously selling one of those calls. By selling a call option, we would be giving the buyer of the option the right, but not the obligation, to purchase our 100 shares at $32.00 per share (the “strike” price) anytime before August 25 (the contract “expiration” date). In exchange for that opportunity, the buyer of the option would be paying us $0.52 per share (the “premium”). There are two likely ways this trade would work out, and they both offer significantly higher income than what we’d collect if we relied on the stock’s dividends alone. If CSCO stays under $32.00 by August 25 our options contract would expire and we’d get to keep our 100 shares. In the process, we’d receive $52 in premium ($0.52 x 100 shares). Excluding any commissions, if “Scenario 1″ plays out, we’d receive a 1.7% yield for selling the covered call ($0.52 / $31.34) in 42 days. That works out to a 14.4% annualized yield. If CSCO climbs over $32.00 by August 25 our 100 shares will get sold (“called away”) at $32.00 per share. In “Scenario 2” — like “Scenario 1” — we’d collect an instant $52 in premium ($0.52 x 100 shares) when the trade opens. We’d also generate $66 in capital gains ($0.66 x 100) when the trade closes because we’d be buying 100 shares at $31.34 and selling them at $32.00. In this scenario, excluding any commissions, we’d be looking at a $118 profit. From a percentage standpoint, this scenario would deliver an instant 1.7% yield for selling the covered call ($0.52 / $31.34) and a 2.1% return from capital gains ($0.66/ $31.34). At the end of the day, we’d be looking at a 3.8% total return in 42 days, which works out to a 32.7% annualized yield from CSCO. We’d place a “Buy-Write” options order with a Net Debit price of as close to $30.82 ($31.34 – $0.52) as we can get — the lower the better. Options contracts work in 100-share blocks, so we’d have to buy at least 100 shares of Cisco (CSCO) for this trade. For every 100 shares we’d buy, we’d “Sell to Open” one options contract using a limit order. Accounting for the $52 in premium we’d collect, that would require a minimum investment of $3,082.